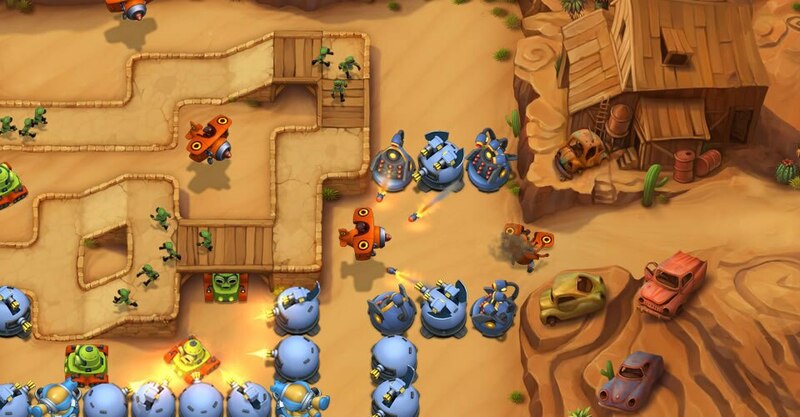 Fieldrunners 2 is the sequel to the award-winning Fieldrunners, a tower defense game developed by Subatomic Studios. 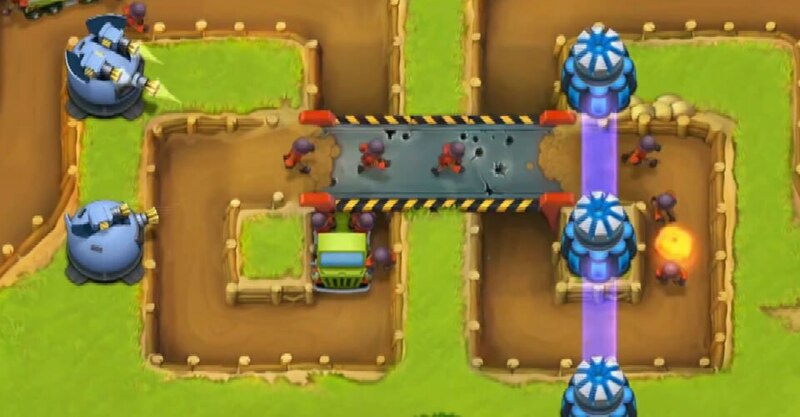 Following up this kind of success is never simple, and the creators wanted to expand on every aspect of Fieldrunners to create a highly engaging experience without compromising any of the core aspects that made the original game so fun and addictive. How did they manage to create more vibrant, enchanting characters on a much larger scale without sacrificing quality and cutting corners? Watch this video, and read the Q&A with the artists below to learn how they achieved their vision. Tell me a little about yourself and how you got into casual game development. I graduated with a degree in classical animation from New Bulgarian University and have been working in the game-development industry for 12 years, covering all aspects of art asset creation—from concept art and illustration, to texturing, 3D modeling, and animation. I have worked on Gothic IV, Project Offset, Knights of Honor, Celtic Kings, Worldshift, and many other titles. I am fluent in 3ds Max and have used it for about 14 years, but I am also experienced with Zbrush, Photoshop, and Premiere. I usually work through the Internet from my home country of Bulgaria but began working for Subatomic Studios on Fieldrunners while I was still traveling—completing my motorcycle trip around the world. On any other project, I might have had a hard time working on my notebook, but with Fieldrunners 2, it was easy, natural, and really fun. 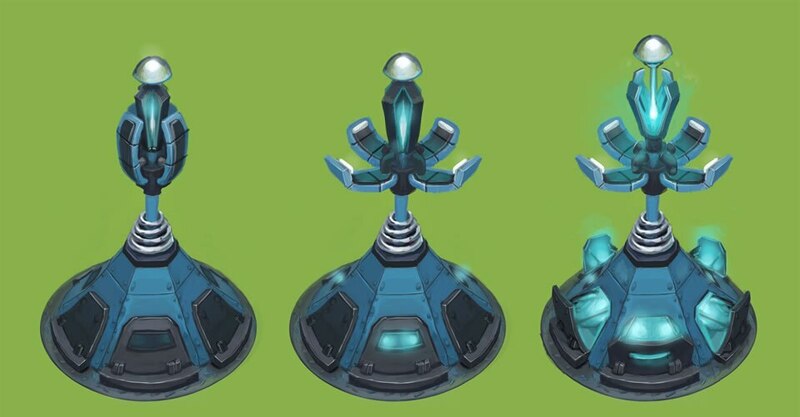 How was asset creation different for Fieldrunners 2 compared to other projects you’ve worked on? Being a casual game, Fieldrunners 2 did not require complex, high-polygon models with lots of high-resolution textures, making asset creation a much quicker and more enjoyable process at every stage—from concept to modeling, unwrapping, and texturing. Sometimes working on titles that require a high level of realism is overwhelming, with a lot assets that need to be done and hard deadlines breathing down your neck. When work is easy and flowing like it was with Fieldrunners 2, it becomes more enjoyable to work, and I believe that always shows in the final result. What was the biggest hurdle you had to overcome while working on Fieldrunners 2? There were no real difficulties to speak of :-). What was the biggest advantage of working with 3ds Max on this project? Because of the distinct look of the game, the Fieldrunners 2 models have to look painted, but still have to be 3D models rather than simple 2D sprites. Since there are multiple animations for each character, I found it really helpful that 3ds Max had an easy-to-use baking feature—I could quickly get the initial shading straight into the texture, so I could manipulate it a bit or start painting directly on top of it, getting the 2D feel that we were looking for. Besides the baking of maps, one of the great features in 3ds Max is the unwrapping tools. It is always a pleasure for me to get to the stage where I get to unwrap stuff. A lot of people dislike the process, perhaps because it falls into the gray, in-between area after modeling and before texturing, but I find it pleasurable and almost meditative to split the UVs into pieces and arrange them in an efficient way. What kind of games do you like to play in your spare time? The games I like to play in my spare time are mostly roleplaying and first-person shooters, but I'm looking forward to Fieldrunners 2 coming out, as I want it to be my first tower defense experience. What is your background as an artist, and what are some other projects you have worked on? I have been drawing for as long as I can remember, but most of the time it was just as a hobby. After completing 3 years of training and working for more than 2 years as an industrial manager, I started to study digital media. In the years that followed, I learned a lot about programming, but I also started to pick up some skills in 3D modeling and animation. I’ve also gained some insight into game development by programming some small game prototypes in Flash, Java, and Objective-C. I had a lot of fun doing all this as a student, but I soon realized that working as a programmer at a company wouldn’t be something that I would want to do for the rest of my life. During my studies I worked as a freelancer for some local clients. I created art for a small advertising agency and did some pitch work for a game developer. In 2009, I finally decided to do what I’ve always loved to do. Inspired by some artists online, I started to practice drawing more seriously to improve my skills. I shared my personal work in an online forum to get comments and critiques. And finally came the day the art director of Subatomic Studios wrote me an email to ask if I would like to work on Fieldrunners 2. How long have you worked with 3ds Max, and what other 3D animation and modeling software have you used? During my years of study I worked with 3ds Max to create assets for my school projects. I also used Cinema 4D from time to time. 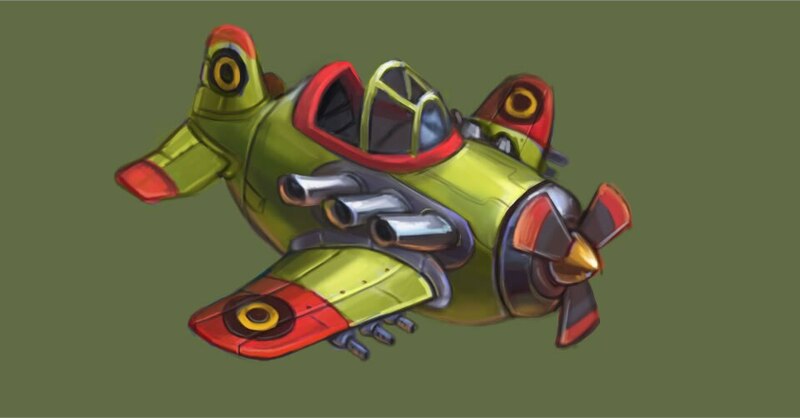 Because Fieldrunners 2 will run on devices with really high resolution displays, it was necessary to create the art assets with a high amount of detail. This was the first time I had to work with such large images containing tons of layers to allow changes to be made at any time in the drawing process. Because it took so long to create each of these images, it was really challenging to stay motivated and patient until they were finished. The time difference between Boston and Germany also had a big impact on communication, especially for feedback. In general, communication with the team in Boston was done via Skype or email, which was a new experience for me. 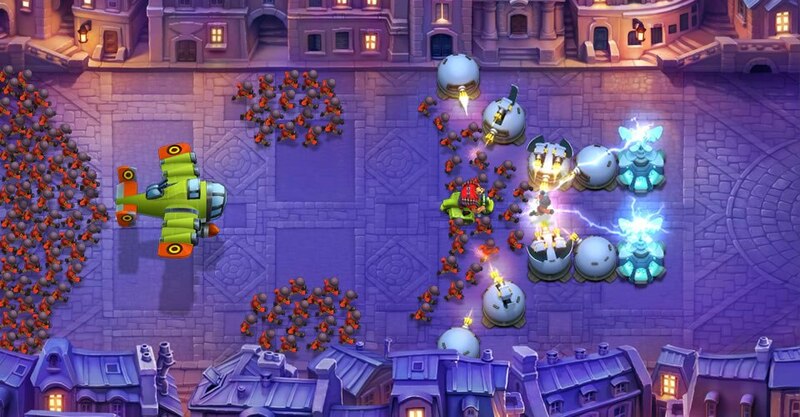 The original Fieldrunners had won numerous art awards for all of its fantastic graphics. My biggest challenge was to create art that would at least meet, but hopefully surpass, that level of artistic quality. 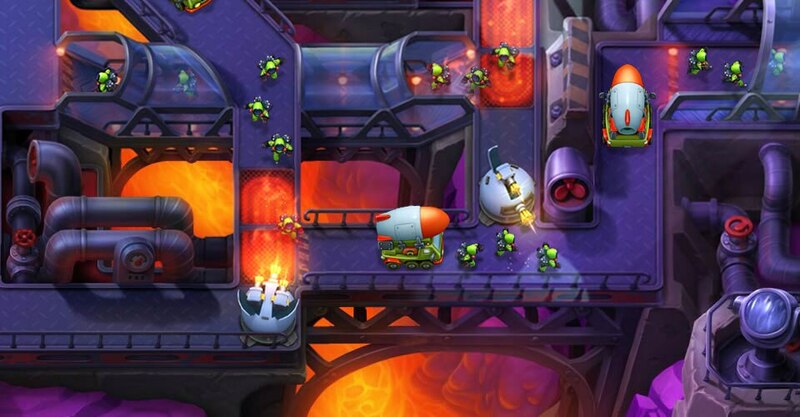 Several of the environments in Fieldrunners 2 are very visually complex. In order to save time painting objects in a proper perspective, I would use 3ds Max to build parts of the scene out of simple 3D shapes and render them out so that I could use them as a guide during painting. What kind of games do you play in your spare time? Several years ago, I liked to play games like Warcraft III, Quake Live, and Unreal Tournament, as well as some of the Mario and Zelda titles. Today when I have time, I mostly play casual games on my iPod and iPad, because they are more relaxing than the games I used to play when I was younger. I enjoy playing all kinds of games, from tower defense to sport games, RPGs, puzzle games and some well-known titles like Doodle Jump and Tiny Wings. I also like to play games like Osmos and Sword & Sorcery, because these games have great mood and atmosphere. I always loved to draw since I was very young. In fact, I don't remember when I wasn't interested in drawing. Since I was in grade school, I wanted to make art for video games. When I was a sophomore in high school, I decided to dedicate myself towards making that a career, and I took my GED. And on the strength of my grades and art portfolio, I got accepted into what was then the only accredited degree program in computer art in the United States at Cogswell College. When I was 19, I left school for my first job, making 3D online games for the summer Olympics website in 2000. Then, my career took a turn, and the company which had been doing online 3D games was acquired by a marker-less facial motion capture company (the same guys behind what's now Google Goggles). This derailed my career into 3D avatar communication for a while. After a few years of that, I left to get back into games. I joined a startup called Cast Iron Games as lead artist. Then, I joined Subatomic Studios in 2009. After my first job making 3D online games, I've always been focused on in-browser or mobile applications. After my time making mobile avatars, going back to mobile gaming was the natural fit. I've used 3ds Max since V2, back in 1998. Over the years, I've used many programs, from LightWave and modo, to 3ds Max and Maya and a bit of Softimage. I learned Maxscript as part of the development of a facial motion capture tool we were developing in 2002, for which I got my first patent, and I've been pretty singularly devoted to 3ds Max ever since. I consider myself a bit of a renaissance man, as I can do 2D art, 3D art, as well as program. It's the most complex 2D system I've ever been a part of. I wrote the exporter for rendering assets out of 3ds Max, and it's a more robust exporter than I'd done in the past. I think the main difference is how we created tag points for particles and multipart models. For instance, an airplane might have a propeller as a separate art asset, and the exporter needed to be able to tag those points with orientation, so they could be combined later with our proprietary tools. It's hard to say for sure. The maps were hard. I painted several of the map backgrounds, and we've got a very high standard for not only quality but cohesion. Trying to make my maps look good enough, detailed enough, and stylistically similar enough was very challenging. Also, as it's a 2D game, figuring out a way to sort everything onscreen (we don't use a z-buffer, because we use a heavy amount of semitransparent sprites) so that we can have bridges that loop was very challenging. For me, being very familiar with Maxscript and being able to write my own tools was a huge advantage. Aside from the exporter, I had a script that would align a camera to perfectly match the bounds of an image with the camera tilted according to our in-game perspective. This way, I could create a 3D object on top of the 2D background, and it would immediately be the proper scale with the 2D art and with the proper perspective. Well, a video game career doesn't provide as much time to play games as I'd like. I was a Nintendo kid and particularly a fan of Megaman, Zelda, and Final Fantasy. 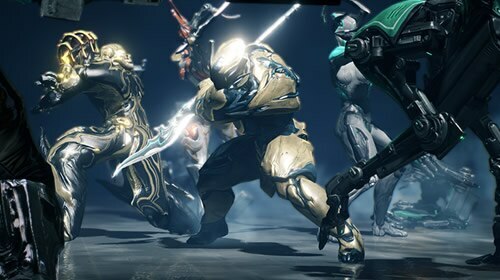 Lately, I play mostly casual games, as they can be more easily crammed into my schedule and, given that I work in mobile games, keeping my finger on the pulse of the trends in casual games feels more productive. I do make the time to play a Resident Evil or Final Fantasy game when a new one comes out, and now that Fieldrunners 2 has shipped, I've got a date with Diablo 3. I joined the game industry in 2004 as a 3D artist. I had made lots of RPG online games and AAA games, and I have worked at Ubisoft (Shanghai) and Epic (Shanghai). So I had a chance to work on titles such as Splinter Cell and Gears of War. I play Fieldrunners and popular shooting games, like Shank. 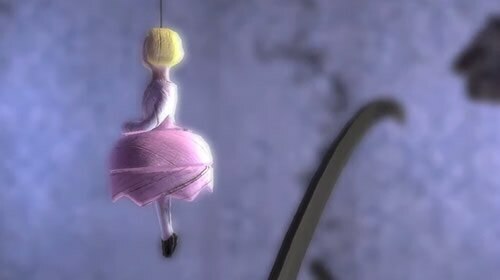 I had worked with 3ds Max for over 8 years. That's my favorite 3D modeling software. But sometimes I like to work with Mudbox to make high-polygon 3D models. How did you get into casual game development? Casual games have become very popular on mobile phones in recent years. Lots of companies want to share in the casual market. Subatomic made Fieldrunners. It's very funny and special, so I'm in. Fieldrunners 2 has a cartoon style, so I used the conventional way of making textures by hand-painting the textures like World of Warcraft. My biggest hurdle was to make the 3D content in the game exactly match the 2D concepts. This was challenging because the concepts were only drawn from a single angle. I had to rely on my experience and my communication skills to make sure that the occluded parts of the concept still matched the style and the artist’s intended design. 3ds Max 2012 has added some new features to its UV tools which I find very useful. I can now work a lot faster when I unwrap models. For example, the new grouping feature added to the Element Properties rollout allows me to define different UV sets, which helps me to unwrap models much quicker than before. Jumping into game making headfirst. Making a AAA-level space ninja game with an indie attitude.